Senseney Music Community Band – Senseney Music, Inc.
Rehearsals for the coming season will begin on Tuesday, April 2, 2019. They are held on Tuesdays, from 7:30 pm to 9:00 pm in the lower level of Senseney Music at 2300 E. Lincoln in Wichita unless otherwise noted. 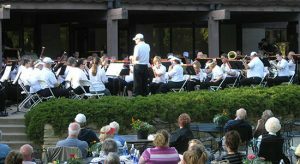 The Senseney Music Community Band was formally organized on April 7, 1987. Its purpose is to provide a performance opportunity for the amateur wind and percussion player. The Senseney Music Community Band has appeared at the Kansas Bandmasters Convention, the Kansas Music Educators Convention, Sedgwick County Fair, Botanica, The Wichita River Festival and many other area events.